Way to go. 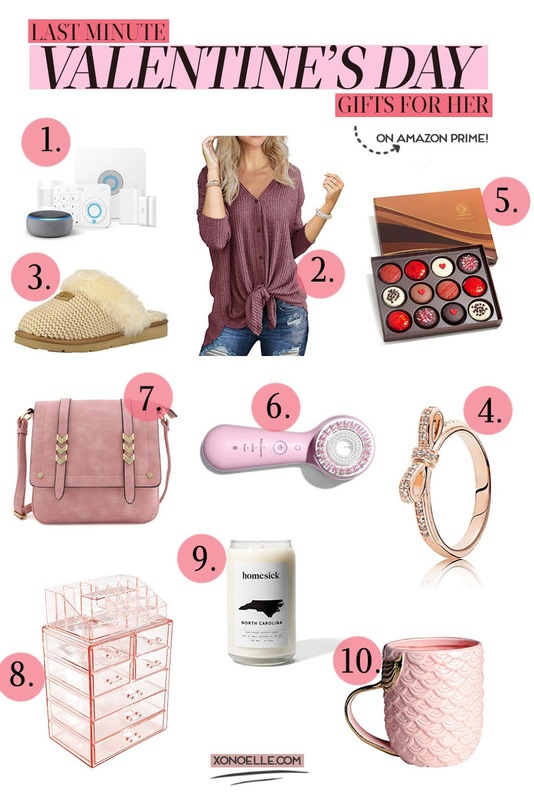 If you're checking out this post that means that you may or may not have gotten a Valentine's Day gift for your SO and now you're panicking. You're in good company, though, as I, too, wait until the last minute for...well...everything. Amazon Prime is my BFF in these situations. I've compiled a little top ten list of things the woman in your life might enjoy and I got you - they're all available on Amazon Prime! Ring Alarm System ($159) - Hear me out. It's a weird gift, but I swear, it's a good one. I'm obsessed with our Ring system and wish we had it when our mailbox got hit not once, not twice but THREE DAMN TIMES. It's all done on an app your download to your phone and notifies you when someone has rang your doorbell and/or approaches your front porch (you can set up a larger or smaller perimeter). IWOLLENCE Waffle Knit Tie Knot Henley ($16.99) - If your girlfriend follows any fashion bloggers, than she's probably seen this henley before! It's rated high, comes in a ton of colors and priced pretty well at almost $17! UGG Cozy Knit Slippers ($119) - Tell me there's a girl out there that doesn't want slippers for any occasion and I will call you a liar. PANDORA Sparkling Bow Ring ($69) - This is the sweetest bow ring! Sweet Love Chocolate Covered Oreos ($29) - Or even chocolate roses! Clarisonic Mia Smart ($179) - Oh, and this! Although, she doesn't have to be a beauty enthusiast to enjoy this! Clarisonic has stepped up their game even more and have introduced an app that syncs with this Clarisonic to customize her skincare routine. Uh, yes please. Alyssa Large Flapover Crossbody Bag ($24) - My mom would love this! It's a smidge edgy with the arrows but I think it'll still work with anyone! Comes in a bunch of colors. I also love this tassel crossbody! Sorbus Pink Acrylic Cosmetic Storage Case ($37) - If you have a beauty product lover in your life, GET. HER. THIS. and thank me later! Homesick Candle ($29.95) - Ladies and gentlemen, I don't care what anyone says. The way to a women's heart is a good candle. And chocolate. And maybe some jewelry too. Who knows. Anyway, these Homesick candles are supposed to be amazing *hint, hint ANT* and you can choose your state's own scent! Mermaid Mug ($18.99) - Whether she's sippin' coffee, tee, wine or whiskey, make sure she's drinking it from a pretty cup!